Kairosoft is one of the most dependably solid Android game developers out there. While their titles tend to have a lot in common, those who appreciate the city builder/RPG formula love it to death. The company's latest title is Pocket League Story 2, which builds on the eponymous original with a handful of new features, most notably the ability to play soccer games (well, sort of) against real-world opponents. Here's the gist: you're the owner of a brand-new soccer team, represented by tiny pixelated players and managers. Kairosoft has already had you managing a race car team, a Japanese inn, and a game development studio, but their latest game, Pocket League Story, will have you training your own soccer team. 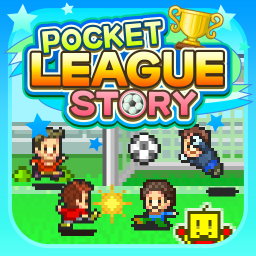 Much like the other Story games, Pocket League Story allows for total control of your team, from picking and training players, to building gyms and stadiums, and even selling merchandise. If you're already a fan of the genre, you'll probably want to pick this up in the Android Market for the usual cost of $5.18.